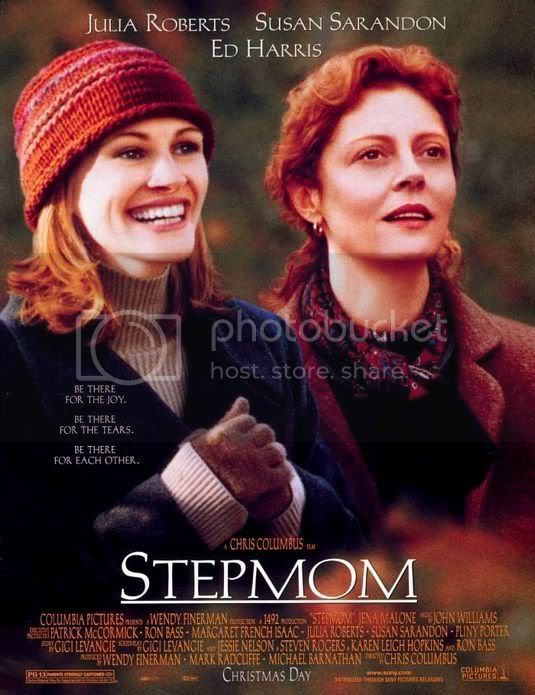 The essential characters in Stepmom are Isabel Kelly (Julia Roberts), a young and talented photographer who has moved in with lawyer Luke Harrison (Ed Harris), Luke’s ex-wife, Jackie (Susan Sarandon), and Luke and Jackie’s two children, Anna (Donnie Darko’s Jena Malone) and Ben (Liam Aiken). The central conflict involves the care of the children, as Luke and Jackie share custody. Problems arise when Luke goes out of town, leaving the clueless Isabel to care for the kids. She is not the most matronly person and frequently has difficulty picking the kids up at the right time, or getting them ready for school punctually, or not losing them in Central Park. This lack of attention and affection raises the ire of Jackie, who reacts like a mother bear. She takes her anger out on Isabel and Luke and ensures that the kids hate Isabel. At random times during the film, however, Isabel tries to gain their trust and love, but Jackie bites back harder. A diagnosis of cancer eventually forces Jackie to rethink how she’s living. One of the more frustrating elements of the film is how neither primary character is consistent. Jackie is motherly and warm, but also revels in taking out her frustration on Isabel. Isabel begins as a career-oriented trophy girlfriend then moves into well-intentioned but incompetent territory, before finally commanding the audience’s sympathy for most of the second half of the film. This shift in sympathies, from Jackie to Isabel (and then changing back to the entire cast for the final ten minutes) is frustrating and distracting, and doesn’t allow the viewer to become fully engaged or involved with anyone in the film. The movie is not all bad, however. There are some interesting elements, and the first half is cohesive and coherent. Stepmom could never be accused of being great cinema, but the opening one and a half acts are credible. It is the remainder of the film that suffers from a lack of a consistent vision on the part of the filmmakers. A few strategically placed melodramatic scenes do not help matters, but instead merely exist to jerk the tears from the viewers’ eyes. Anything involving kids and their parents and cancer is inherently sad; they shouldn’t have added the extra effort to ensure maximum emotional impact as it causes the film to seem overly manipulative. There is an audience for films like Stepmom, and fans of Hallmark movies will not be disappointed at the higher production values and acting presented here. Roberts is effective as the titular character, and her story arc is the most complete and credible. Ed “Blue-Eyes” Harris is a great middle-man between the two women, though he disappears for sections of the second half. The children are cute, but some of their dialogue is precocious at a level where it becomes obvious that they exist to manipulate the audience. An over-long story coupled with a confusing second half and some cheesy scenes serve to undermine any of the positive elements of the film. Critical movie-goers might be turned off by the overtly emotional scenes, as well they should. I was not impressed with the film, saddled as it is with its myriad shortcomings.